J.A. 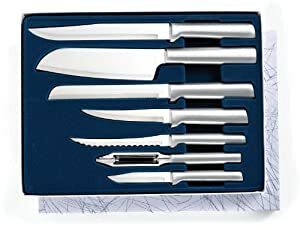 Henckels International Everedge 13-Piece Knife Set with Bonus Cheese Knife now is on sale at Amazon.com for $49.99 (Reg. $125) with free shipping. This set of knives could be purchased as a gift for house-warming. 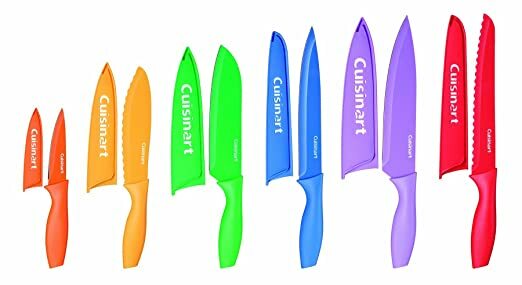 Cuisinart Advantage 12-Piece Knife Set Cuisinart的这套彩刀， 现在降价只要$15.35一套， 原价是39刀。 而且这套刀具的 review非常滴好， High-quality stainless steel blades， Non-stick color coating for easy slicing。 Including an 8" chef's knife, 8" slicing knife, 8" bread knife, 7" santoku knife, 5-1/2" utility knife and a 3-1/2" paring knife. Target.com now they have dropped the price on this Chicago Cutlery Wellington 3 Piece Knife Set to ONLY $13.98 (regularly $39.99). Free in-store pickup. This set includes a 7-3/4″ Chef Knife, 5″ Utility Knife and a 3-1/2″ Parer. This would make a great wedding or housewarming gift! This knife includes two high quality stainless steel blades (bread blade and carving blade) and a wood block storage tray. 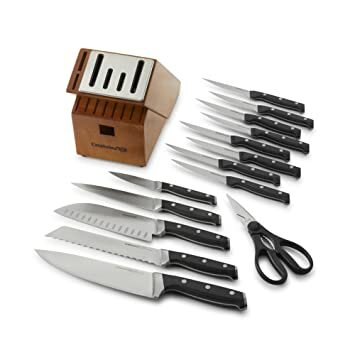 Amazon.com now get this highly rated Calphalon Classic Self-Sharpening 15-piece Cutlery Knife Block Set for only $83.99 shipped (regularly $219.99) after you clip the $35 off coupon! This is a GREAT price as this same set is selling for $154.69 at Jet.com. This block set has built-in ceramic sharpeners that automatically sharpen knives with every use. 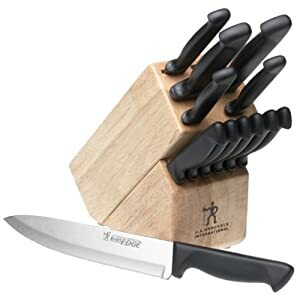 This set includes a 4-1/2-inch Paring Knife, a 6-inch Utility Knife, a 6-inch Serrated Utility Knife, a 7-inch Santoku, an 8-inch, a Chef’s Knife, Kitchen Shears, 8 Steak Knives and the Sharpening Knife Block. 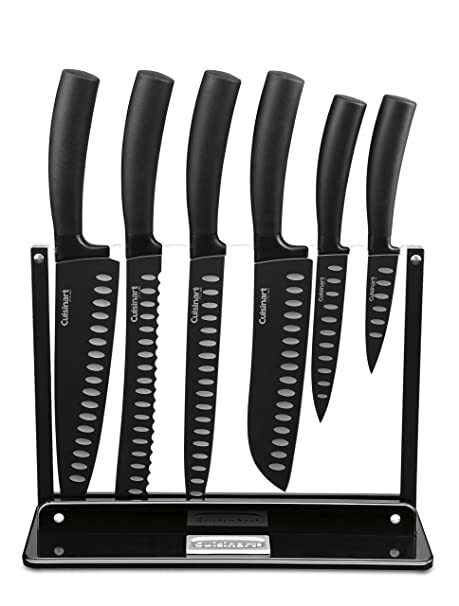 Amazon.com now you can get this Calphalon Contemporary Self-sharpening 20-piece Knife Block Set with SharpIn Technology for just $137.46 shipped (regularly $299.99) after you clip the $102.35 off digital coupon! 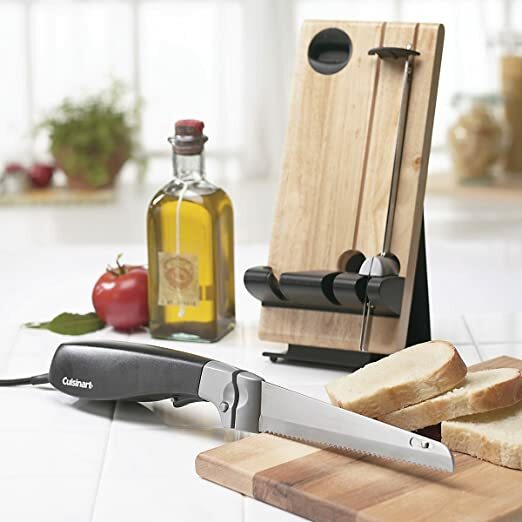 It features fully forged, German steel knife blades and includes a knife block. 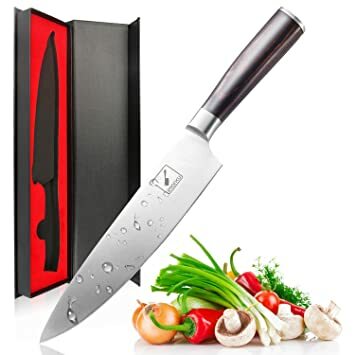 Today, December 9th only, Amazon.com now they are offering some HOT savings on Imarku brand kitchen knives! This Imarku Pro Kitchen 8″ Chefs Knife for just $18.99 (regularly $99.99)! This knife is made from high-carbon stainless steel with an ultra-sharp edge and features an ergonomic handle. This knife has an ergonomic handle with a non-slip grip and is made of precision forged German cutlery steel that resists rust, corrosion, and discoloration. Today, December 30th only, Macy’s is offering an additional 20% off select housewares merchandise – no promo code needed as the discount is shown during checkout! Even better, you can also take an additional 20% off when you apply promo code FIT at checkout. This KitchenAid Architect Series 16-pc. Stainless Steel Cutlery Set for just $51.19 shipped (regularly $169.99) after the promo code FIT at checkout! 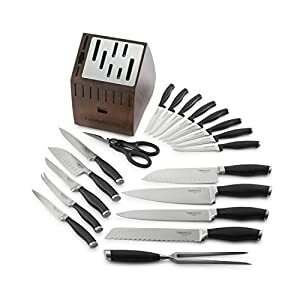 This set includes knives, kitchen shears and a knife block with an integrated sharpener. Today, January 25th only, On Amazon.com now you can save up to 60% off select KitchenAid Gadgets, Cook’s Tools and more. These KitchenAid Shears with Soft Grip Handles in Red or Black for just $6.39 (regularly $11.79) – lowest price ever! 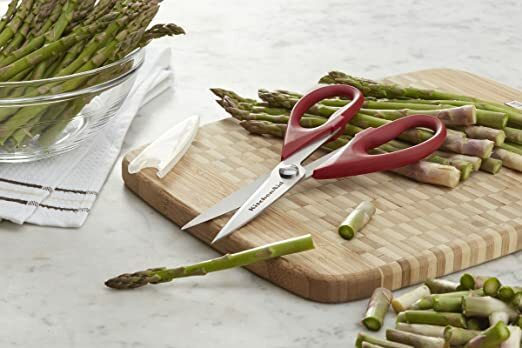 These heavy duty shears feature a sharp stainless steel blade and soft comfort grip handle and are dishwasher safe – and they have fantastic reviews! 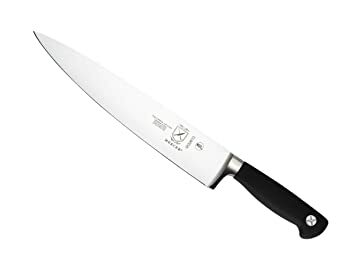 On Amazon.com you can now get this 8.2" Tojiro DP Gyutou Chef's Knife on sale for $59.99. Shipping is free. Through March 12th, on Sears.com where Shop Your Way Rewards members (free to join) can get $40 back in points when you spend $40 or more on home products including bed, bath, kitchen and more! Note that qualifying items will be marked “Spend $40, Get $40 Cashback in Points”. Oster Whitmore 14-Piece Cutlery Set with Rubber Wood Block $40.49 (regularly $44.99), Get back $40 in points, Shipping is free on orders over $25, Final Cost after points only 49¢ shipped! 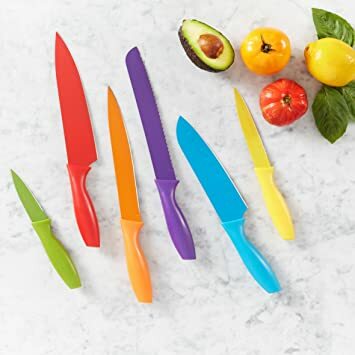 On Amazon.com you can now get this highly rated AmazonBasics 12-Piece Colored Knife Set for only $11.85 (regularly $15.99) – lowest price ever! 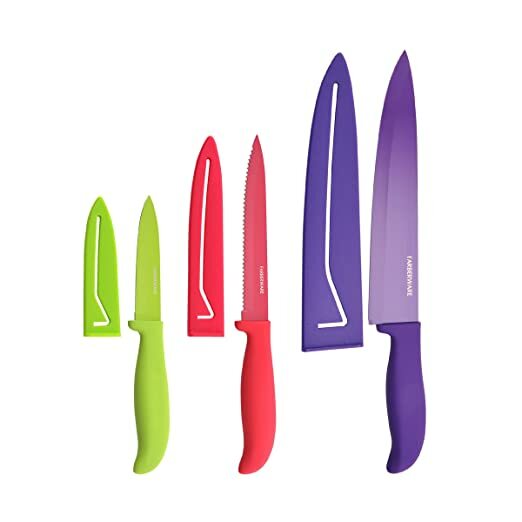 This knife set includes six knives and six matching knife covers to keep the blades protected and to allow for safe storage in a drawer. The nonstick color coating helps prevent food from sticking to the blades for faster and easier cutting. Through June 4th, go to Macys.com where they dropped the price on this Martha Stewart Essentials 30 Piece Cutlery Set down to just $27.99 (regularly $70). This set includes a four-piece measuring cup set, six-piece measuring spoon set, peeler, can opener, slotted spoon, solid spoon, turner, pasta fork, knife sharpener, 8″ chef’s knife, 8″ bread knife, 6.5″ Santoku knife, Scissors, 3.5″ paring knife, 5″ utility knife, six steak knives and a Rubberwood block to store everything.